When it came time to take my kitchen cleaning back to WWII the list of cleaning supplies was pretty short. 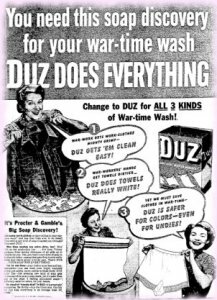 Household cleaning, especially during WWII, came down to some simple staples: vinegar, baking soda, salt, ammonia, bleach, Watkins supplies, Borax and Coca-Cola. 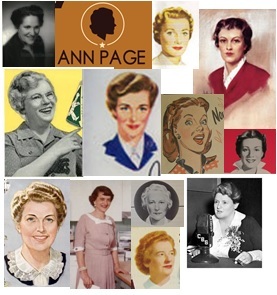 I had a picture in my mind that my grandmothers would have been using products we refer to as “green cleaning” today – natural and safe enough to put in food recipes also, but that wasn’t always the case. Under the heading of “When You Know Better You Do Better”, came the emerging chemistry of cleaning supplies. 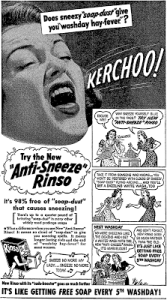 Harsh cleaning chemicals were in demand as the country rebounded from The Great Depression and considered hospital-grade sanitation necessary at home. 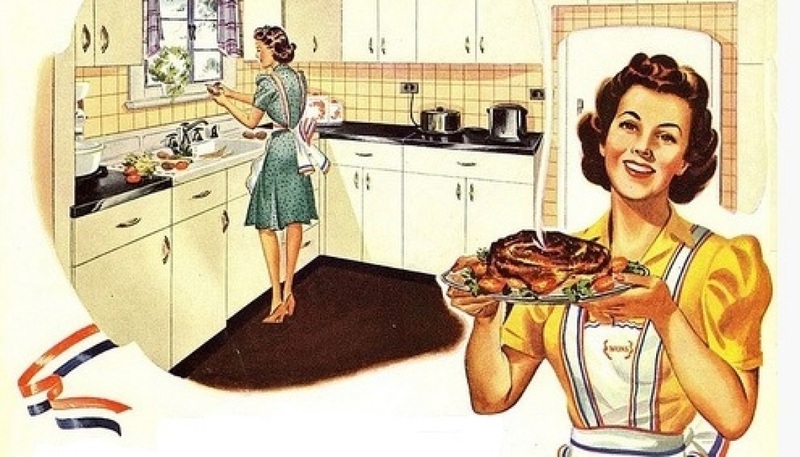 Housewives were hearing the scientific name of the cleanser, as opposed to our “dumbed-down” advertised names today (carbon tetrachloride, anyone?). Advertisements went to great lengths to intelligently reason with the consumer and share the logic of buying the product. Watkins, known for medicinal salves and spices, devoted 90% of its production capacity to support the Allied war effort. 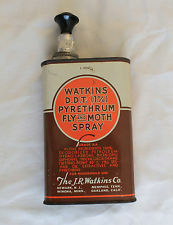 To fill government contracts, Watkins produced dried egg s, powdered juice packets, vitamin tablets, hospital germicide, DDT and insecticide powder. From the same letters, I came to understand the enormous chore of laundry. 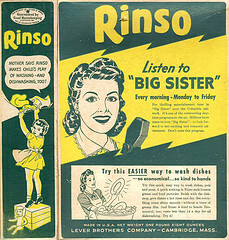 Most cleaning product advertising from the time was devoted to the task. Suds were really important when it came to proving clean. It’s Procter & Gamble’s Big Soap Discovery! 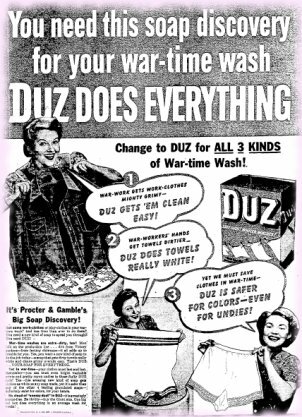 War-time washes are extra dirty, too! Men folk on the production line . . . dirt from Victory gardens — from factory chimneys — it all adds up to trouble for you. Yes, you want a new kind of soap to do the job today — a soap that gets dirty towels really white and cleans grimy overalls easy. That’s DUZ. . . YOUR SOAP FOR EVERYTHING. Yet In war-time— your clothes must last and last. Remember — you can trust even bright washable prints and pretty rayon undies to those fluffy DUZ suds! Yes— this amazing new kind of soap gets clothes as white as any soap made, yet it’s safer than any of the other 4 leading granulated soaps — definitely safer for colors, for your hands. Soak: Soak cotton and linen articles in lukewarm soapy water, or in cold water with borax, 2 tablespoons to the gallon. Soak handkerchiefs separately. Do not soak colored or wool articles. Wash: Wring out the clothes from the soaking water. Wash with plenty of hot soapy water made with shredded washing soap, soap flakes or jelly. Use two lots if necessary. Rub dirty clothes gently on a wash board with your hand or a nail brush. Do not rub silks, rayons, and wool. Use only mild soap for them, and do not put them in very hot water. Rinse: Soften hard rinsing water with borax. Repeat warm rinses till the water is clear, and add a little glue to the last water for white cottons and linens. Dry: Dry outdoors when possible, but do not put silks and wool in the sun or too near the fire. Hang white cottons and linens in the sun to bleach. Dry colored articles in the shade, inside out. Starch: The heavier and wetter the material, the more starch you need, and if you wring with a wringer you need thicker starch than if you work by hand. Starch articles inside out, using hot starch for white things and cold tinted starch for colored ones. Use blue to tint blue, cochineal for pink, coffee or tea for brown, and a vegetable dye for green. To mix starch, make a smooth paste with starch and cold water, using a wooden spoon, then add boiling water until the starch is clear. Mangle: Leave clothes until quite dry, then sprinkle them evenly. Fold and roll up, and leave them for an hour before mangling or ironing. Pull garments into shape and put them evenly between the rollers, protecting any buttons. Iron: The iron should be hot enough to splutter when touched with a wet finger, and you should iron as quickly as possible, continuing till the material is dry. To iron a garment, first go over all parts that hang off the board, then iron the center. To bring out a pattern or monogram, iron on the wrong side over a thick pad. Have a very hot iron for starched articles and a moderate one for silks and wool. Press damp knitted goods between flour sack towels.